​The Blue Bridge Center for the Delta Arts announces the 10th Annual Delta Visual Arts Show on Saturday, February 24, 2018 in downtown Newport, Arkansas. The show will be open to the public at 10 a.m. and runs through 6 p.m. 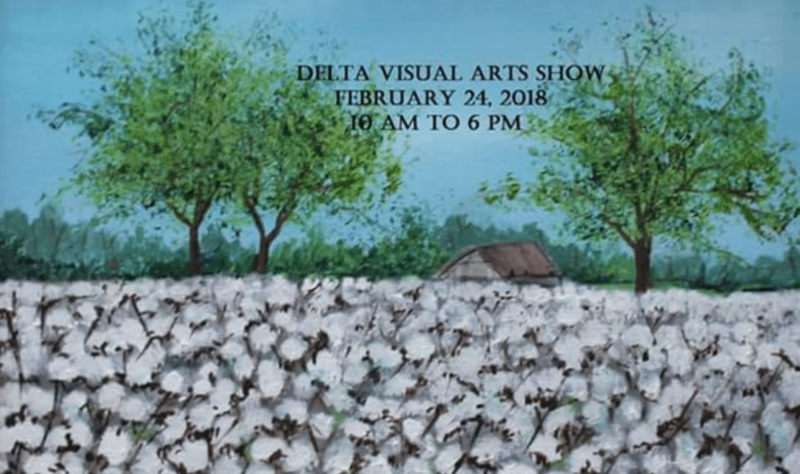 This year’s show features 210 visual artists, 25 Authors and 10 Musicians from four states and 65 Arkansas communities, highlighting primarily artists who grew up in the Delta, live or have lived in the Delta or who produce Delta themed work. The visual art covers a broad range of art from pottery to painting and jewelry to sculpture. The literary art features artists who write in a broad range of categories, including fiction, non-fiction, poetry and children’s works.The show will be held at several locations in downtown Newport including the Iron Mountain Train Depot on Front Street, the Newport Business Resource Center on Hazel Street, the First Baptist Church Family Life Center on Second Street, St. Paul’s Episcopal Church on Third Street, The First United Methodist Church Fellowship Hall on Laurel Street, Frankie’s Place on Front Street, the Future Museum Building on Third Street, the Grimes Building on Second Street, the Shear Magic Building on Front Street, the W.A. Billingsley Library on Walnut Street, and a heavy-duty tent that will turn the Walnut Street into an art gallery. Artists will have their work on display, and visitors will be able to meet the artists as well as purchase pieces. This is a unique opportunity to own an original piece of art and to understand how the artist produced the piece. Several artists will be conducting demonstrations at their booths during the show. The show features well-known artists from throughout the state and young new artists who are setting up for the very first time. Each venue will have live acoustical music. Musicians will also be playing extended sets at Frankie’s Place from 11 am to 6 pm. For a complete list of artists participating feel free to email director@newportaredc.org. ​An amazing young artist will paint to music in a performance art session that will thrill adults and children. She will perform two shows during the day – one at 10:30 am and one at 4:15 pm. Both shows will be at Frankie’s Place on Front Street. Make plans to see the very first performance art session at the Delta Visual Arts Show. In addition to being able to visit with artists and purchase art work, there will also be workshops throughout the day. The Delta Visual Arts Show will feature workshops and demonstrations for adults on various artistic techniques. All workshops are free and links to the event pages can be found on the Blue Bridge Center for the Delta Arts Facebook page under events. This year there will be workshops for youth, with two workshops aimed at children from 4 years old to 8 years in the morning and two workshops aimed at ages 9 to 13 in the afternoon. The workshops are free and information will be located on the Blue Bridge Center for the Delta Arts Facebook page under events. ​The Blue Bridge Center for the Delta Arts is also hosting the Annual Children of the Delta Youth Art Contest in connection with the 10th Annual Delta Visual Arts Show. Awards will be given in four categories: Pre-K and Kindergarten, 1st and 2nd grades, 3rd and 4th grades, and 5th and 6th grades. For complete guidelines and contest deadlines contact the Newport Economic Development Office at 870-523-1009. 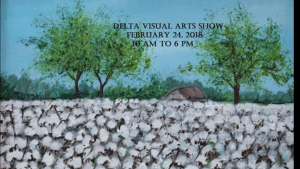 The Annual “This is the Delta” Art Show for adults who are participating in the 10th Annual Delta Visual Arts Show will be held this year. Awards will be given in the following categories: painting, drawing, sculpture, photography, pottery, mixed media, jewelry and woodworking. The winners, including 1st, 2nd and 3rd place in each category and a Best of Show will be announced by noon on February 24, 2018 in connection with the 10th Annual Delta Visual Arts Show. All entries will remain on display upstairs in the Newport Business Resource Center throughout the show. ​This year the show will feature several downtown eating establishments. MJ’s Café on Third Street will be open for their wonderful lunch options. Frankie’s Place will be open on Front Street in the Brick Terrace Gardens Building. Several food trucks will be available during the show at various locations downtown. Convenient transportation from venue to venue will be provided by both the Art Train and the golf cart limo that will make regular rounds. ​Sponsors for the show this year include the following: George Kell Motors, Representative Michael John Gray, Harris Ford, the Iron Mountain Regional Arts Council, Merchants and Planters Bank, Newport Construction, Inc., Scott Wood Ram Truck Center, Unity Health Harris Medical Center and WMRC Medical Complex Newport. The Blue Bridge Center for the Delta Arts project is a joint project of the Iron Mountain Regional Arts Council, the Downtown Revitalization and Improvement Volunteer Effort (DRIVE), Entergy, Jackson County Council on Tourism, the City of Newport, the Newport Economic Development Commission, the Newport Area Chamber of Commerce and hundreds of local volunteers. Development of the show was facilitated by the Clinton School of Public Service in Little Rock. Funding for advertising is supplied through the Ozark Gateway Tourist Council. Artists from last year’s show also donated pieces that were auctioned to raise funding for this year’s show. For more information feel free to call 870-523-1009 or email director@newportaredc.org.